We are currently experiencing issues with our emails please contact us by phone if you have any enquiries. This is a modern detached Bungalow on an exclusive development set in a peaceful rural location between the towns of Lockerbie, Moffat and Lochmaben. 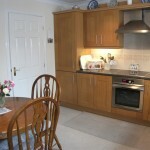 A well-maintained and attractively presented property in walk-in condition and must be viewed to be appreciated. All carpets, curtain poles and blinds are included in the price. 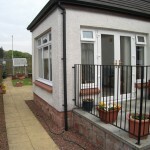 Benefiting from oil central heating and double-glazing. 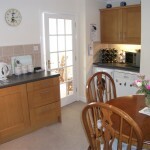 Johnstonebridge is a small Village surrounded by beautiful countryside. The Village has an excellent Primary School, Doctors’ Surgery and small Post Office in the Village Hall. Johnstonebridge is around six miles from the lively town of Lockerbie, where there is a main line railway and a number of shops. 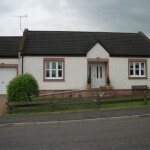 It is also around eight miles from the popular Village of Lochmaben and the busy town of Moffat. 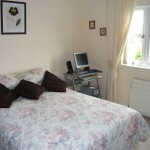 Access to motorways, north and south (M74) is approximately five minutes driving distance from the Village. 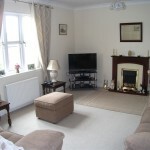 A light, airy versatile room and a much used addition to the home.Fitted carpet. Light fitting. Ceiling coving. 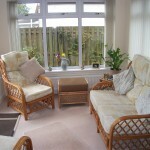 3 pane uPVC double-glazed picture window. Telephone point. TV point. 3 Double power points. Double radiator. 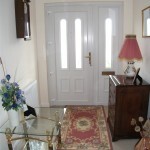 Patio doors with two matching side panels lead out to the veranda. Fitted carpet. uPVC window overlooking the rear garden. Centre light fitting. Ceiling coving.Doubleradiator.2 Double doored fitted wardrobes with shelving and hanging space.3 Double power points. TV point. Telephone point. Fitted carpet. uPVC window overlooking the front garden. Double radiator. Double-doored fitted wardrobe with hanging an shelf space. Centre light fitting. Ceiling coving. 2 Double power points. 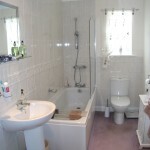 Large family bathroom with white 3 piece suite comprising pedestal wash-hand basin, w.c. and bath with overhead shower. Shaver point with light. Partially tiled walls. uPVC frosted glazed window overlooking the rear garden. Ceiling coving. Spotlights. Large storage cupboard comprising airing shelving and Shaver point with overhead light. Radiator. The veranda is framed with decorative wrought iron and offers a spacious area for seating. 3 Steps lead down into the garden pathway which is paved with a gravel border. This takes you to the large patio area laid with paving. Proceeding on past the patio onto the lawned area of the garden, stepping stones are scattered, leading to the Whirlygig. Flower borders are decoratively laid to the front with a vegetable patch to one side. Greenhouse. 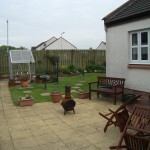 This garden is well maintained offering the keen gardener a pleasant environment in which to work and relax. Outside tap. Wood fencing boundary. The Oil Tank and Wooden Shed are to one side of the garden and discreetly partitioned off. Paved pathway to one side of the property leads via a wooden gate to the front. Integral Garage has an electric door. 2 Double power points. ‘Warmflow’ combi-boiler with thermostat on the wall. Strip light. Light loft flooring giving the property some very useful storage capacity. 1. Solicitors in Scotland deal with all aspects of property transactions, including the marketing, sale, financing, purchase, leasing and factoring of both private and commercial properties. 2. These Sale Particulars are prepared for guidance only and, while every care has been taken in their presentation, their accuracy is not guaranteed. 3. Interested parties should immediately advise the selling agents of their interest so that they may be kept informed of developments, such as the fixing of a closing date for offers. Henderson & Mackay have prepared these particulars with care. We, as agents, have not tested any structures, equipment, appliances, heritable fixtures, fittings, systems or services (gas, electrical or otherwise) and therefore cannot verify that they are sound, in working order or fit for their purpose. Prospective purchasers are advised to have all matters critical to their needs verified by their solicitor, surveyor or other appropriate advisor. Measurements are approximate and for guidance only. In particular, we caution against their use when assessing or ordering furniture, fitments, carpets, etc. Where floor plans are drawn, please note that they are not to scale and are for illustrative purposes only. 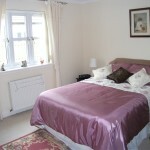 Photographs are purely illustrative and not indicative of the extent of the property or what is included in the sale. Whilst we endeavour to make our sales details accurate and reliable, if there is any point which is of particular importance to you, please contact us and we shall, if possible, check the information, particularly if you are contemplating travelling some distance to view the property.